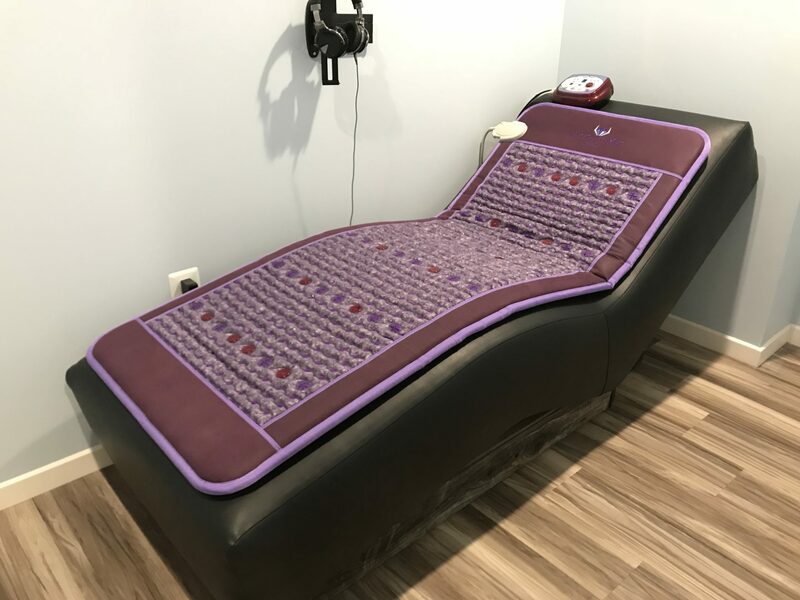 The Amethyst BioMat is a device that uses age-old healing tools to provide relief from your pain and other health problems. As you lie on the mat, you will feel amethyst crystals and soothing vibrations with powerful healing effects. The BioMat emits magnetic fields, infrared rays, and negative ions identical to your body’s own fields. This energy helps recharge your cells. For optimal benefits from the RestStation™, we suggest clients purchase session packages based on their personal condition. Therefore, there is no member vs. non-member rate. How many RestStation™ sessions are needed to see results? Depends on what you are trying to overcome. Typically once a week is a good benchmark. The human body is mostly made up of water and energy. The vibration of the energy interacts with the water to make you feel better. When your vibration is off, your body is not able to heal itself. What are the health benefits of using the Amethyst BioMat? You will initially feel a relief of pain and tension in your shoulders, back and elbows, as well as your other muscles and joints. Infrared rays have been shown to help with many conditions, like chronic fatigue, obesity, depression osteoporosis and general inflammation. The BioMat contains 15-17 layers, the majority of this being visible Amethyst crystals that form the surface. When this heats up, they release rays that our cells absorb. These rays can penetrate up to 6 inches into the body, raising our body heat, promoting blood circulation, and speeding up metabolism. What can I expect after a BioMat session? After a session, it is important to sit for a few minutes and drink a glass of water while your body sorts through the energetic changes. Over the next few days, you may have more energy, or you may also feel a lack of energy. Both are normal. If you feel a lack of energy, it is because your body is cleansing and restoring at deep cellular levels and is using a lot of energy. By drinking plenty of fluids you will assist your body to easily go through the healing process. Can I give a RestStation™ and BioMat session as a gift?